As Heise reports, Sun Microsystems has released their seamless ODF plug-in for Microsoft Office. That means that users of MS Office are now also able to use the ISO-standard format for office documents, which should lead to easy file exchange with users of standards-compliant office program suites such as OpenOffice.org. Sun’s solution integrates into the file save/open dialogs of MS Office, thereby making importing or exporting uneccessary. This is a different approach than the one taken by Microsoft and Novell in their so-called “OpenXML/ODF Translator Add-in for Office”. Additionally, Sun Microsystems is the first to release a stable method of conversion, while Microsoft and Novell’s implementation currently lags behind in terms of features and stability. Because curiosity is the slaughterer of felines, I couldn’t keep my hands off the Wii Virtual Console over Christmas. I rather painlessly bought 3000 Wii Points, pointed at Legend of Zelda and a few minutes later I was twenty years younger. Super Mario Bros., Zelda, Metroid and Kid Icarus are the first games I have truly vivid memories of. But Zelda will always be a special case even among those jewels of the 80s. Perhaps because of the save function (no other NES game had that at the time), perhaps because of its then monumental size and variety, perhaps because of all the secrets to discover or the surprisingly fresh arcade/adventure hybrid gameplay. Maybe it’s the combination that does it, but even after twenty years, Zelda can still make me grin (and whistle the theme song, but that’s a detail you don’t want to know). If you show the game to kids nowadays, I’m sure you’ll reap yawns and/or blank stares. It’s not even easy to figure out where to go in the beginning, unless you have the map and booklet that were included with the original. Something your EUR 5 can’t buy you on Virtual Console. Although Nintendo do offer a digital manual booklet with every VC release, the rest of the new game experience can’t be replaced. Where’s the smell of new plastic? Where’s the feeling of despair as you discover cocoa stains on your lovingly sticky-tape-armored map of Hyrule? Sniffing Game Cube game boxes and printing pixel-perfect screenshot maps from the Web just isn’t the same. One question remains, of course. Why is playing Zelda on VC better than playing Zelda on your NES emulator of choice? I don’t think I can make up an answer to this one. For me the most important point is that VC plays the games exactly like they were on the original consoles, down to the actual video signal. If I still had the TV I used in 1987, I probably wouldn’t see any difference at all. PAL territories even have the same ugly black borders, wrong aspect ratio and slowdown they were already treated to in the 80s. Is this worth paying EUR 5 for? I doubt it. But as it does so often, nostalgia easily fogs the mind, poisons the spirit and makes you buy things at unreasonable prices. Your non-gamer friends will never understand why you’ve paid actual money to battle spitting octopuses as a pointy-eared green-clad elf child. Only your heart will. And by the way, there’s only one proper way to play these games. Do you feel bloated often, especially after a creamy dessert? Do you spend your days silently placing innocent little farts into your office chair, your sofa, your car seat? And do you like to eat milk products, drink milk or eat chocolate? Don’t be embarrassed, then. You might just have lactose intolerance. Lactose intolerance is a condition where your intestine no longer produces lactase, the enzyme needed to digest lactose (milk sugar). Instead, you just get gas. A lot of it. In bad cases, and if you don’t stop consuming milk, you get diarrhea and an inflamed intestine. Actually, you as a human being should not be able to digest milk as an adult in the first place! But in their rather colorful past, northern Europeans and subsequently Americans have developed a genetic mutation that allows them to drink milk even as adults. By far most of the world’s population, however, is lactose intolerant. Entire peoples are. The Chinese, most nations of Africa, the entire country of Thailand and a whopping 75% of African Americans are just a few examples. What makes things worse is that lactose is used in many non-dairy products, such as sausages or spice mixes, or as a taste amplifier. Lactose intolerant people should be extra careful when shopping. Examine those labels! If you feel a lot better and more relaxed, if you have less problems with diarrhea and no longer suffer from wave after wave of odorless flatulence: Welcome aboard, you might be lactose intolerant. Perhaps in a later article, I can give you some shopping and cooking hints. Do check with your doctor to be sure. I take no responsibility for your actions. 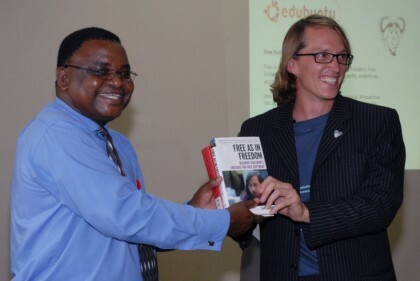 Alex Antener yesterday managed to wrap up this year’s stage of his Free Software project in Malawi, Africa with the official handover of the two complete thin client networks donated by the University of Applied Sciences and Arts, Zürich (my dear employer). In the picture you see Martin Thawani, librarian of the Polytechnic Library, accepting the symbolical gift “Free as in Freedom“. That book “interweaves biographical snapshots of GNU project founder Richard Stallman with the political, social and economic history of the free software movement”. The GNU project is what makes GNU/Linux and the GNU tools possible in the way we know them today. Alex Antener’s approach to helping the African nation cross the digital divide is different than that of many other organizations and individuals. Instead of dumping northern computer trash on poor schools that certainly won’t ask for something better, he flew across the continents with 70 kilograms of the latest geek toys in his hand baggage. Highly modern servers based on the Intel Core 2 Duo CPU as well as state of the art thin clients by Fujitsu-Siemens — machines newer than what is used in most European organizations! That’s what we use here, why should we cover Malawi in our outdated tech trash? That’s just a convenient way for northern nations to lighten their consciousness and their recycling budget. Instead, Alex set up the thin client network based entirely on Free Software, then made it transparent how the whole thing works, how it’s maintained, what the nuts and bolts are and where to find help to help yourself. These things would be impossible or severely limited had he used proprietary software. Additionally, the servers he installed make sure that the Polytechnic gets the most out of its prohibitively expensive Internet connection. Firstly they offer proxy caching services, meaning that things downloaded from the Internet are downloaded only once, later the locally stored copy is served and the Internet connection is not taxed anymore. Secondly, the machines are immune to viruses, spyware, trojans and other malware, so the plague of bandwidth-swallowing infected machines is over. I also took part in the project with some consulting, because I believe the way large western and northern corporations treat African nations of Malawi’s rank is appalling. Africa is often merely abused by private institutions and NGOs to siphon development aid money out of their own (or foreign) governments. Then there is the cultural pollution that comes from large companies like Microsoft and Cisco. They try to impose their proprietary technology, then teach their proprietary thoughts. It’s apparently easy to take a network engineering course in Malawi, but try to learn any other technology than Cisco’s and you will soon run full-speed into a concrete wall. Africa is not supposed to learn about its possibilities. Africa should be thankful! Thankful that we lower ourselves to its ridiculous level and teach it about our wonderful American products. Only Cisco routers shall they know, only Microsoft operating systems shall they use. Operating systems that African companies can gladly buy from us. Oh, don’t worry about payment, my friend, development aid has you covered. Alex has demonstrated that there are other ways to bridge the gap, to give access to knowledge that is useful in any context, not just inside one single company’s little sandbox. Free Software was nothing new at the time. GNU/Linux and open standards like the ISO standard OpenDocument format were nothing new either. But the average Malawian computer user does not know about these things, even though it’s a Linux distribution by an African man’s company that is the most popular in the world at this moment. The Polytechnic now has all this information, and it stands as an inspiring example of what is possible. A few hundred people have learned about their possibilities in these last two months, and thousands and ten thousands more still have the opportunity in the coming years. Madonna’s adoption scandal may have catapulted Malawi into international headlines, but for my friends Alex Antener, Nathalie Bissig and me, the country has had some significance long before US pop stars have started buying children out of it. I’m trying to support Alex’ new project in Malawi, “Exterminate All the Brutes”, from here. So as you can guess, these impressions are not my own, they are photographs and drawings made by Nathalie Bissig in Malawi, who is in charge of documenting Alex’ work as well as doing work of her own. Nathalie has posted a blog entry with some more information and a link to the photo album of her sketchbook. The images are free content, released under the Creative Commons ShareAlike 2.5 license. I just wanted to tickle your curiosity for these wonderful images. I will probably write about the software libre aspects of all this at a later date, or in the blog at lix.cc. Over there, I’ve already talked about thin client setups with Edubuntu that the students of The Polytechnic will subsequently be working with. I participated in a protest against [Digital Restrictions Management (DRM)](http://www.drm.info) today in front of the DataQuest Apple Store near Zürich main station. Georg Greve wrote an [article about the event](http://drm.info/node/64), so why should I bore you with my own recapitulation? All in all, I was amazed how much time people actually spent to listen to us explain the situation, and how many agreed that DRM is a bad idea, and giving it legislative backing through the panicky, overly restrictive copyright laws that are now threatening to come to Europe is even worse. PS: You just have to check out the [iPod ad inspired artwork](http://drm.info/taxonomy/term/4) they have there, as part of the [Defective by Design](http://www.defectivebydesign.org) campaign. I think it conveys the DRM idea quite cleary.